If you like these deluxe rope barriers, you may also like to view the entire range of rope barriers or retractable barriers. We are very pleased with the rope barriers. They were exactly what we were looking for. We had been looking at purchasing rope barriers but they were expensive. These were a fantastic price and they look professional. I will definitely be recommending the Q-Line range. " This rope barrier set is manufactured from stainless steel which has been polished to a chrome mirror finish. Posts stand tall at 1 metre tall & the blue velvet rope is 2 metres long, & 5cm in Ø. Included is a 5 year warranty. We believe these are the best value stanchions on the market. The quality of the construction is excellent, yet we are making them available, with the velvet rope, for half the price you might pay elsewhere. The weighted bases of the posts provide stability and makes the posts very difficult to knock over. They also have a rubber rim on the underside that ensures any floor surface will not be damaged or scratched. 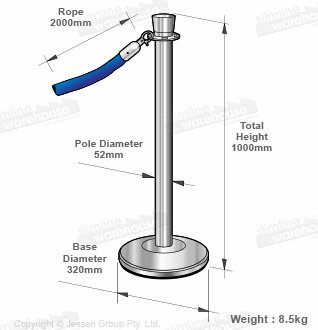 Q-Line queue poles allow you to arrange queues and lines in any configuration you may require thanks to the 4 way head of the post onto which ropes are quickly clipped and removed. Each set is carefully packed for safe shipping and arrive unassembled to reduce freight costs. When you receive your rope barrier set, no tools are required for assembly – you just screw them together by hand. 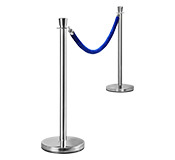 Use rope barrier stanchions for all occasions including receptions, hotel lobbies or theatres. 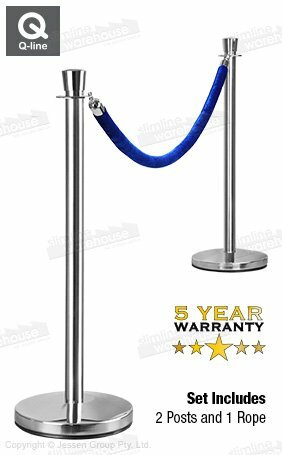 These rope barriers are ideal for creating queueing systems or rope fencing to protect areas on display such as in galleries or car showrooms. These crowd control rope barriers are manufactured with stainless steel which has been polished to give the appearance of chrome. The posts of the crowd control barriers are weighted to give stability and are unlikely to be easily knocked over. The stanchion crowd barriers have also been fitted with a rubber rim to avoid any scratching of the floor surface. The crowd control rope barrier ropes have a core of foam which has been wrapped in blue velvet. The ropes of the rope barrier are finished with matching silver hooks which have been fixed to each end of the rope. The stanchion rope barriers can hold up to 4 rope barrier ropes at any one time. This will allow you to create lines or queues in any configuration within your premises.